Home INVESTIGATIONS SECTION An Alien Craft sending energy beams to the ground - Or What? An Alien craft sending energy beams to the ground – Or what? 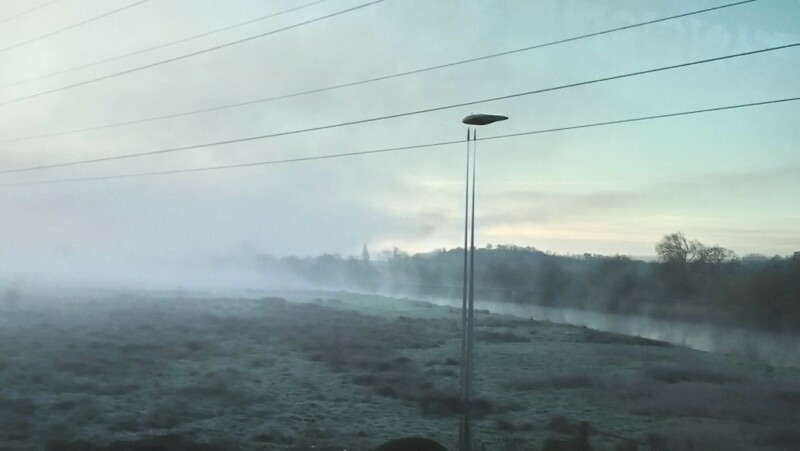 One of the most interesting Sighting Report cases to come my way for evaluation in 2018 has to be the one in which the witness (who we will call Jane) took several photographs of the sunrise behind electricity pylons on a misty morning back in January 2018, whilst travelling on a Megabus coach. 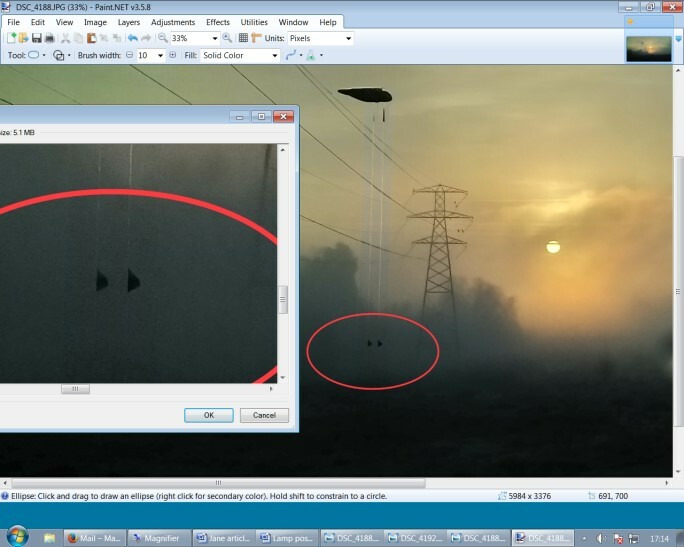 It wasn’t until a few months afterwards when Jane downloaded and viewed the photographs on a computer that she noticed on three of the series of about six or seven photographs, a strange looking black ‘object’ in the sky with two long thin protrusions reaching down to the ground. All of the photographs were taken within one minute of each other, but the mystery object which was not noticed at the time of taking the photographs was visible only on some of the shots seemingly at random, although it does appear to have been photographed from both sides and the front giving it perspective and consistency as a ‘real’ object, not a dirty lens etc. The case details and photographs are reproduced here by kind permission of the photographer, who retains the copyright. Well at first glance (and second and third) I was stumped to find a conventional, rational explanation for the mystery object, i.e. not dirty marks on the coach window or a kite etc. So whilst considering what it might be (the page was empty at this stage) I decided to ask our BUFORA Astronomy specialist Dave Newton (who is also pretty hot on visuals) to have a look and see what he thought. 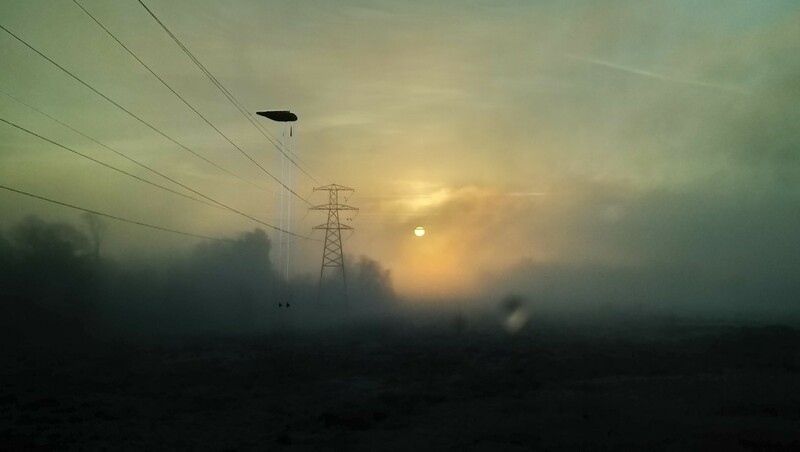 Dave felt that the shape of the object resembled a double legged streetlamp, and also noticed a number 4 visible in photograph #3 towards the lower portion of the leg(s). 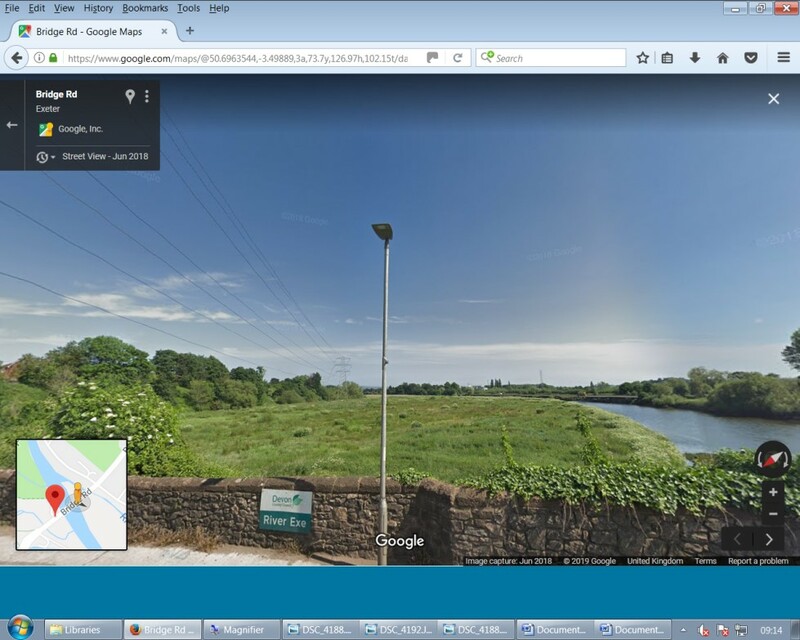 Well, this certainly was a Eureka moment giving us a thread to follow up on, and with the help of the witness giving us the exact location where the photographs were taken from (Bridge Street in Exeter), I went onto Google Maps street view to see what could be seen. 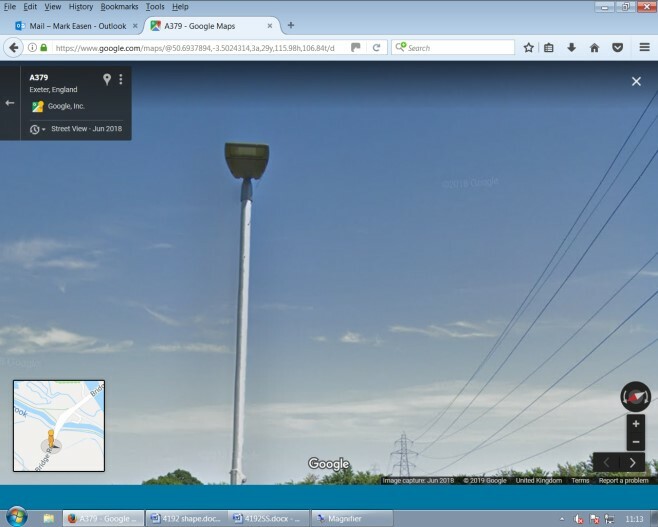 At the closest view point on street view to where photograph 3 was taken, the image (below) shows a street lamp, which I’m sure you will agree bears a striking similarity to the photographed object. But the icing on the cake was when I zoomed in on the lower portion of the leg. 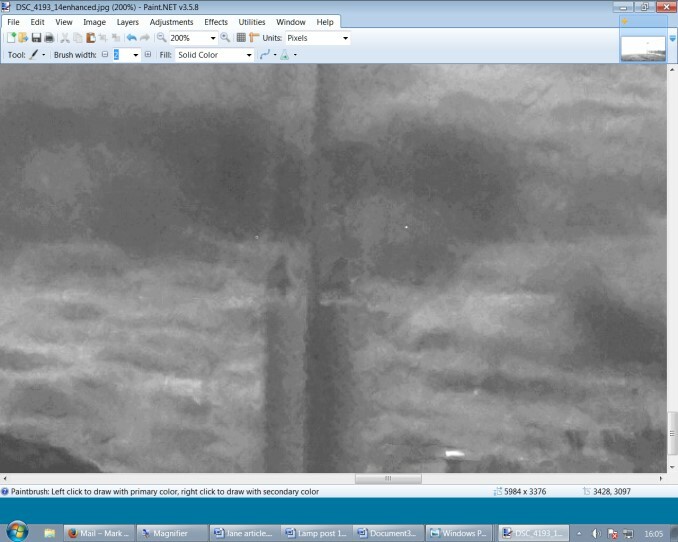 As you can see from the zoomed images below, by comparing a section of the original photograph (in enhanced brightness & contrast) to that of the street lamp in the Google Street View, one can now clearly see that the lamp post has the number 4, plus it’s in the same font as the 4 in the photograph, plus a number 1 can be seen just above it, which is also just about visible in Jane’s photograph. So, I would say that is pretty conclusive evidence of the previously ‘mystery object’s actual identity being lamp post 14. We will address the mysterious ‘double legs’ issue a little later on. 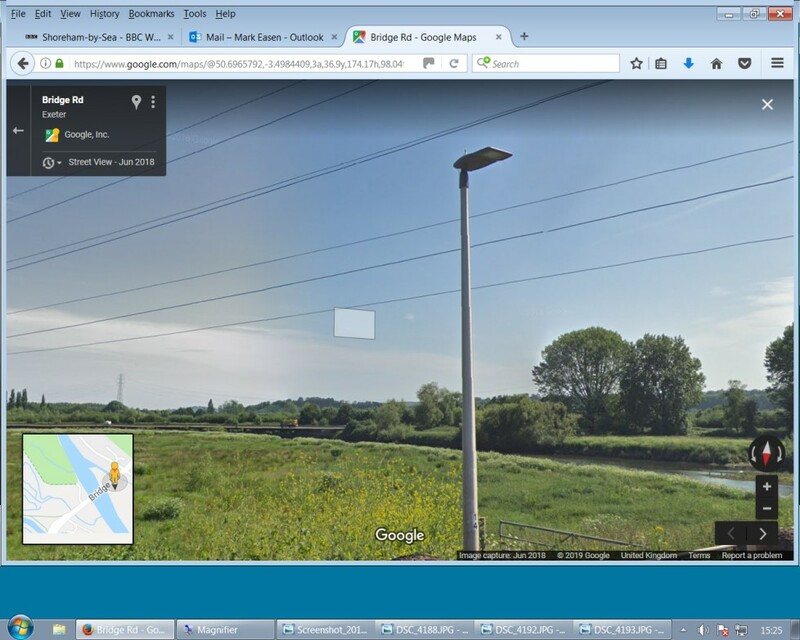 Now, moving on to see what similarities we can find (if any) between the first photograph (which was taken on the other side of the pylons) and the view at the same location on Google street view which is slightly back along the road. At the closest view point using the pylons as reference, once again we find a lamp post; (No. 15 this time) with the head tilted to the left from this viewing angle. 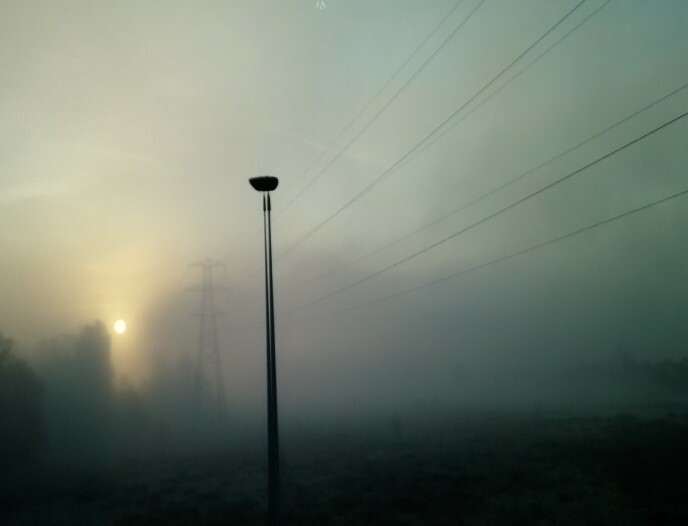 A further feature identifying lamp post 15 as being the likely mystery object in photograph #1 is the triangular shaped protrusion that can be seen halfway up the pole. 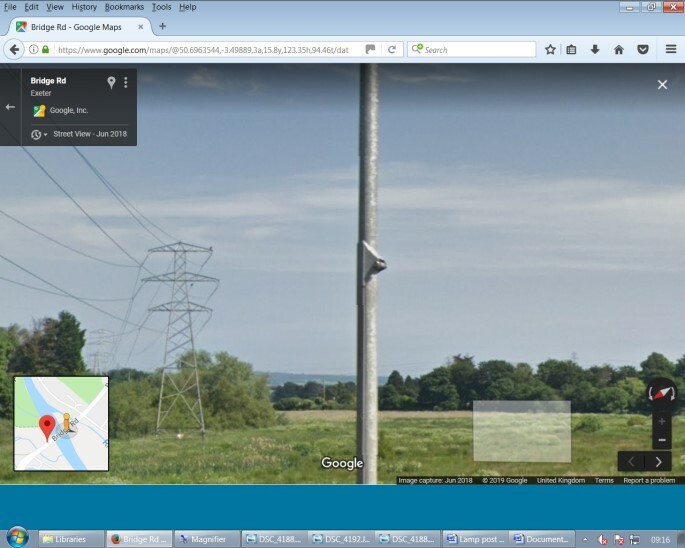 I will attach a close up of the Google Maps image and the witness’s photograph #1 below for comparison. As well as making a comparison with the triangular protrusion (circled on the left) showing good correlation on both images, we can also establish that compared to the Google car’s position: the witness’s photograph would have been taken a fraction of a second earlier, and obviously from a higher vantage point being on a coach thus changing the perspective slightly, but the similarity between the two is still very good – note the shape and relative position of the trees to the pylon. 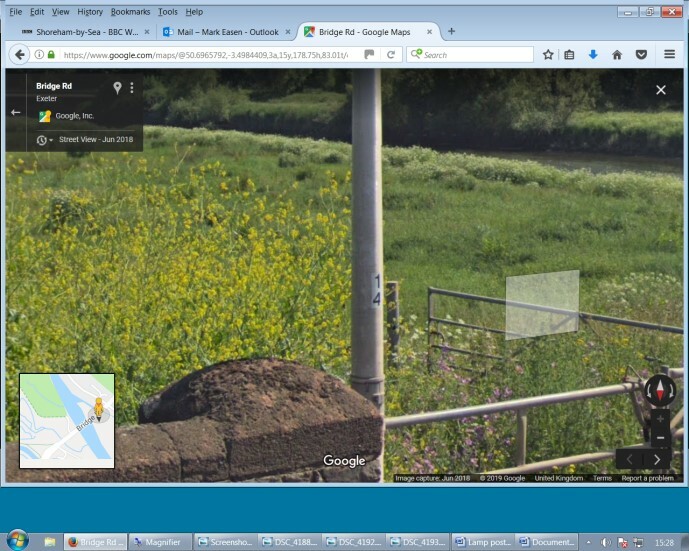 Having successfully found a good match for the ’mystery object’ in photographs #3 and then #1, the final photograph that needs its likeness compared to what we can see has been recorded by the very helpful Google street view car is Jane’s photograph #2. This is more of a ‘head-on’ or frontal image than the previous ‘side-view’ shots, and I attach both of the images below for comparison. As well as the general shape being similar (after some allowances are given for slightly different perspective, plus the obvious ‘double exposure’ effects which we will consider later) we can also see that the odd ‘conical’ shape seen near the head on photograph #2 is also visible on the street view image. The head seems slightly wider on the photograph (left), but I would say only by the same extra amount as the double image spacing on the legs, therefore I’m sure we are looking at the same object. Without doubt, the appearance of the lamp posts in Jane’s photographs is strikingly different to the way in which they appear on the Google images, and there will be a number of reasons for this. Firstly, let us consider what could cause the ‘double exposure/ two legs’ effect? We know that Jane’s photographs were taken through a coach window, and as we know (and as I have previously documented on a separate BUFORA website article) photographs taken through glass are very susceptible to reflections and image refraction. Especially where the glass is double glazed and tinted (as in the case of a Megabus). Added to this, the coach would have been moving at some speed, and with the lamp posts being the closest objects to the camera they would have a faster rate of movement across the frame than anything else in the shot, therefore they would be more difficult for the camera to accurately capture in focus, even at a fast shutter speed. Combine this reflection effect/ limitation with the Sun back-lighting the poles giving extreme colour and tonal variations that made the lamp posts appear semi-translucent at times whilst black at other times, plus the fast angular movement of the camera relative to the foreground subject (lamp posts), with the low overall lighting which would mean the camera using a larger aperture with less ‘depth of field’ which means it is less able to focus on objects outside of its auto set focus distance which probably was infinity, and perhaps not surprisingly we can see the camera was struggling and seemingly on (or just over) the limits of its lens and internal processing ability to accurately capture what was actually there in every true detail. Dave and I did also consider that if due to the location right near high voltage power lines, there may also have been some kind of EMF (electro-magnetic force) affecting the camera’s processing but we concluded that the coach would probably have been acting somewhat as a Faraday cage which would make this additional possibility less likely. In an attempt to validate some of my thoughts on photographic distortion whilst I was on a long distance coach journey myself just after the sighting first came in, I was able to similarly obtain the double exposed appearance of street lamp legs and also the very black when back-lit appearance, further adding to my confidence in these theories. Although the combination of factors in my test photographs were nowhere near as high or extreme as they were in Jane’s case, which is a very good example of just how strange otherwise ordinary objects can sometimes appear under certain circumstance in photographs, and just goes to show that the old adage “The camera never lies” is not always completely correct. Although the combination of factors leading to the high degree of strange effects observed in the original 3 photographs above is quite rare, it certainly is worth considering if this may a factor in future cases with weird images – rather than always simply taking the captured image at ‘face value’ as being a 100% accurate rendition of what was actually there. It is good to have found a robust explanation for the weird looking objects, and it might be worth reminding ourselves here of the old saying that “where sufficient evidence is available, around 98% of all ‘UFO’ sightings can be shown to have a perfectly rational explanation”. I certainly have learned a lot from this case and I would like to thank our witness Jane once again for submitting her sighting report & photographs, and for kindly giving us her permission to upload her case details onto the BUFORA website to share with the wider public. My thanks also go to the whole BUFORA team and in particular Dave Newton and Heather Dixon for their valuable investigations assistance and support. I hope that you readers at home have found this article interesting.